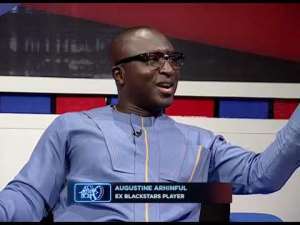 Former Black Stars player Augustine Arhinful has called on Premier League Clubs to work in unison with the Ghana Football Association (GFA) Normalization Committee (NC) to help complete their mandate and to ensure football in the country is normalized. The committee which was set up by government of Ghana and FIFA were mandated to run the daily affairs of the GFA, review the statutes of the association and ensure they prepare the grounds for the election of a new President. With their 31st Match 2019 deadline fast approaching, it is obvious they will not be able to complete their mandate. Many believe the work of the NC has been delayed due to unhealthy back and forth with some stakeholders of the sport, especially the Ghana Premier League Clubs. Speaking to Joy FM yesterday on a possible extension of the timeline for the NC, Augustine Arhinful has called on the Premier League Clubs to find common grounds with the NC and work together for the betterment of Ghana football. “I believe that they should work hand in hand with the Normalization Committee to arrive at whatever decision that we will all want to arrive at”, Arhinful said. He further indicated that he has no problem if indeed FIFA gives the NC an extension for them to complete their mandate. According to him, the committee has a lot to do and obviously needs more time to work. “I don’t have an issue because in the wisdom of FIFA they take decisions that will better suit all of us. I will be difficult for me to tell you what the Normalization Committee has done, be it positive or negative. I really don’t know”. “They were given until the ending of March but per the actions of the Premier League Clubs especially it’s like they are on a coalition course all the time and it’s not healthy for our football”, he added.